Recovering pool table cushions comes before we refelt the pool table top. This is not that hard to do and, when done carefully, turns out quite nicely. 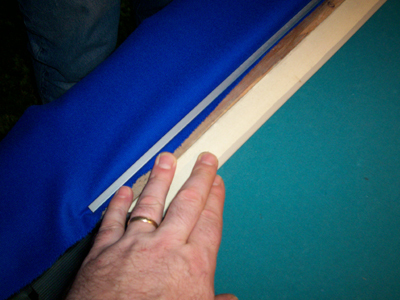 Starting at the center, and working your way to one end, gently tap the metal strip into place, leaving about 1/4″ of extra pool table felt showing all the way down. Don’t pound the metal strip all the way in yet! Just enough to hold the felt and the strip in place. 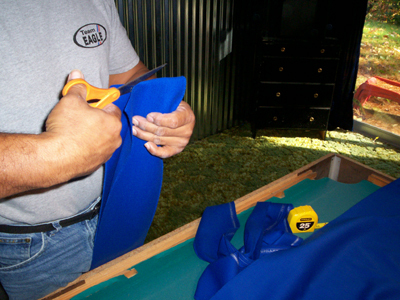 You want it to be poking up a little bit so that you can use it as a guide when trimming off the excess felt once it is all secured. 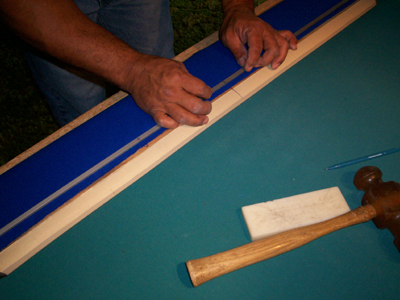 Gently pull on the Pool table felt from the end to keep it straight as you work your way to the end. Remember, DO NOT pound it in all the way yet. 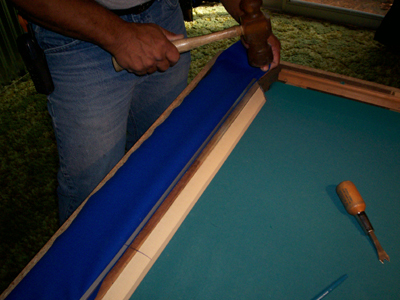 As you work your way from the center to the end, you will have to adjust the pool table felt felt back and forth, while gently pulling it tight so you keep it as smooth and straight as possible. This is very important when it comes to refelting overall and when recovering pool table cushions! Here you can see that there is about 1/4″ of pool table felt running all the way down the rail. 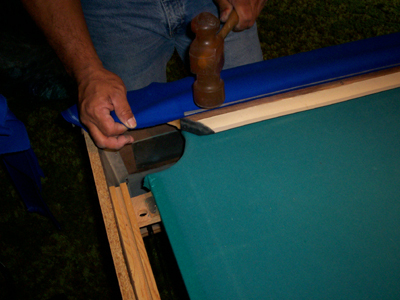 When recovering your pool table cushions, this is critical.